Consultant Gary Saleeba ticks off what he believes the advantages of a municipal utility to be. If public sentiment expressed at a hearing Thursday carries any weight, voters in Millersburg are likely to get an election on the question of whether the town should expel Pacific Power and take over the electric system within the city limits. 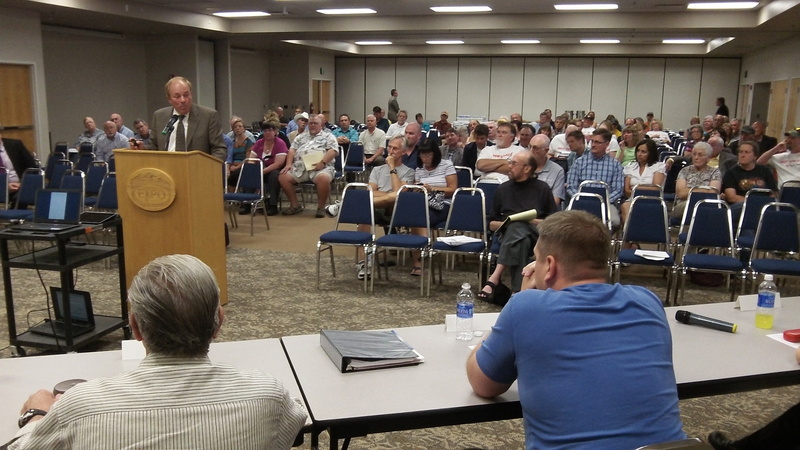 Speakers demanding an election (I counted seven of them, including the lead spokesman for Pacific Power) were greeted with vigorous applause from what seemed like a majority of the 80-100 people attending the hearing at the Linn County Expo Center. 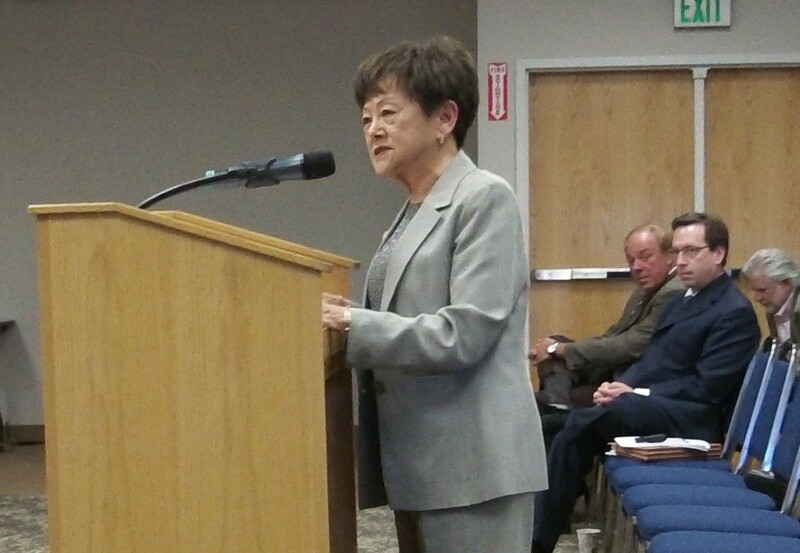 Former state Sen. Mae Yih urges the council to form the municipal utility because it would benefit residents. It was the second of two planned public hearings before the Millersburg City Council, and it got a little testy at times as council members Jason Yutzie, Scott Cowan and Darrin Lane pushed back against criticism of the council’s handling of the public power plan in its early stages, starting in October 2012. Pacific has complained that the plan was discussed in secret meetings between the council, ATI Wah Chang and various lawyers and consultants. Lane countered that the meetings were legal executive sessions under Oregon’s public meetings law, a point Pacific’s Scott Bolton conceded, and that the press was given notice and invited to attend. The election question dominated Thursday’s hearing. 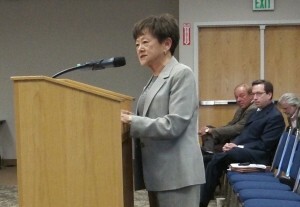 Pacific’s Bolton asked the council to put the issue on the ballot this November. The council did not react to that request but could take it up later. Ortherwise the hearing was similar to the first one May 20, though less well attended. Pacific said the cost of the takeover, through condemnation, would be around $50 million and not the roughly $20 million estimated by the city’s consultants. On the other side, Gary Saleeba of the EES consulting firm of Kirkland, Wash., said a city utility would save ratepayers millions and help lead to more jobs in Linn County. One of Saleeba’s points was that the typical Pacific customer’s monthly power bill was $100, whereas a city utility customer’s bill averaged $70. And he said the $70 covers everything, including paying off the cost of buying the system. Some in the audience questioned the $100 claim, saying their Pacific bills were much lower. But someone else said hers was higher. Jin Denham of Wash Chang and Saleeba bore down on Pacific’s reliance on coal, the fuel that generates about two-thirds of its power supply. Their point was that complying with the Obama administration’s edict to reduce CO2 emissions by 30 percent would force Pacific’s rates higher. One unexpected highlight: Mae Yih, the venerable former state senator, and the widow of a former Wah Chang president, made an appearance at the hearing. She said that during her 24 years in the legislature she had always focused on the best interests of citizens. She urged the council members to do the same and approve the municipal utility. Thank you Hasso for your continuing investigation into the PP/Wah Chang dispute. I had intended to go to the June 19 meeting but due to illness was unable. Instead I wrote an email to the Millersburg councilors asking for the true estimate of costs from each side of the issue. Millersburg voters should have all the facts before they can cast an informed vote (if such a vote is taken). I am skeptical about the widow of a former Wah Chang president expressing an opinion on the Pacific Power/Wah Chang wrangle. I believe someone in her position should recuse herself. Further, I don’t know of any legislator who wouldn’t say they were acting in the best interests of their constituents! I wonder which ones. Could not agree with you more Peg ! I attended and spoke at last nights meeting. Of the (I believe) 3 people that spoke for the City MUD; 2 did not live in the City. One of those was former Rep. Yih. She was one of the first commenters and left after she made her statement. She spoke of politics in general not specifics on the MUD. Another commenter lived in SweetHome, and is a Union Steel Workers Rep for Wah Chang. One other “pro” commenter that lived in town…works for Wah Chang. The remainder of the comments were overwelmingly against the development of a MUD and for a public vote. The reaction from the audience to them was in agreement. As I mentioned last night, only Wah Chang is pushing this concept. I have heard NO ONE, I repeat NO ONE complain about their current electric bills or of the service they receive from Pacific Power. We as citizens do not want to take on the financial risks of developing a public utility ! I was appalled by Council Member Cowan who called a study done for Pacific Power a lie/and that Pacific Power was lying. Per the Council’s own statements; their goals (at least what they say) have been to collect information and data to help them make a decision. That they are not taking sides. So they should then be open minded. In an open public meeting calling Pacific Power liers was just over the top. I believe this is where the Council screwed up; Wah Chang approaches them with this MUD concept and the Council signs confidentiality contracts and moves. on. The Council at that time should have consulted with the citizens to see what we wanted. If we even wanted them to proceed to look into this matter. Then the Council signs contracts that they refused to disclose to the public (PP received heavily redacted copies through legal filings) and they have held in secret, Executive sessions. My wife and I attempted to attend one of these sessions and were told we could not. Yet, Wah Chang representatives were invited into the very same meeting. I understand that reporters were NOT invited into these meetings until the Fall of 2013. Then we get to all the propaganda the Council and Wah Chang has either produced or is on their Web site. Any person of right mind reading that web site would feel it is a sales job “for” the MUD. It is all “pro” information and languaged that way. One of the Council members (who I will not disclose) finally admitted to me last night agreement with this very observation. The Council has apparantly had the Pacific Power LCS study for a month but it has not been posted on the web site. Council Member Lane asked PP Mr. Bolton what he wants disclosed from so-called secret meetings. Well here is what I think we all want to see; Minutes from every Executive Session involving the MUD proposal, the unredacted copy of the agreements made with Wah Chang, a unredacted copy of the contract with EES consulting, copies of all materials provided by the same, a full financial accounting of ALL City funds and staff time that has been spent on the MUD proposal, an accounting of all Attorney fees. If the Council did this…then that is what I call transparancy. As far as DEQ regulations and Obama orders on coal plants. These regs will take place over a period of 20 years and in 2 years we are also shopping for a NEW President ! All those regs can be overturned and may not effect rates here anyway. Public vote ! Public vote ! Get it ? …..public vote, comit to it now as a philosophy on this project !